Traveling to Lebanon for the first time had me full of conflicting emotions. I was excited to get to know the homeland of my paternal grandparents and the place my father came back to to attend the American University in Beirut and reconnect with his roots. But was I setting myself up for disappointment? Was I expecting too much?? On the flight over I had a layover in Frankfurt and until then my fellow passengers were a mix of people from all over the world. But when we passed through the boarding check-in to the waiting area for the Frankfurt-Beirut flight, I was surrounded by people who reminded me of my aunts, uncles and family friends, each had a silhouette or a gesture that was familiar. The only difference was that I was the only female traveling alone. This caused quite a bit of eyebrow raising and let them know that there was something different about me. Yes I could blend in with them, until I opened my mouth, but even still many were speaking French, English and Spanish. One very sweet Muslim woman was very intrigued by me and once on the plane as I sat bobbing my head fighting sleep, she found a way to sit next to me. Her flowered head scarf brought her eyes to life as she anxiously asked me about my trip. I explained that I am third generation Lebanese returning to the homeland my grandparents left over 100 years ago. I told her about The Fez Documentary and the film festival I was attending. We talked the whole flight and I was reminded of the countless other friends, friends of friends and distant relatives who all generously offered tid- bits of information about Lebanon, where to go, what to eat and offered their WhatsApp number for me to contact them or their family members. It all became clear to me that this generosity I was experiencing was no fluke. This is the way of the Lebanese, this is the way of my family, this is my way. And this Lebanese generosity was shared with so many who came to The Fez which is one of the reasons that make it so special. 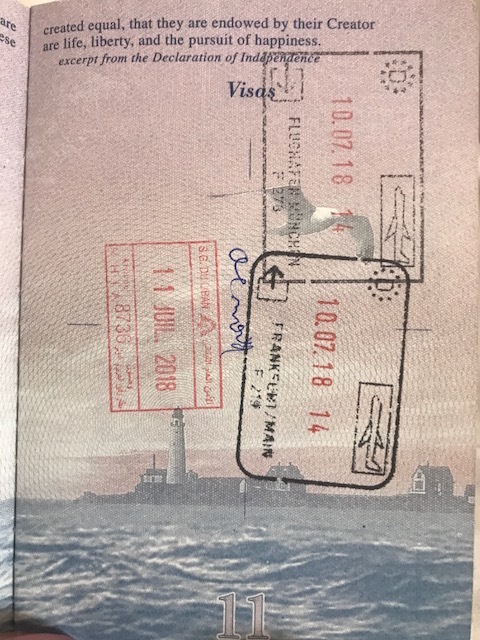 Well after 20 some odd hours of travel, I arrived in Beirut and finally received the stamp in my passport that I had been waiting a lifetime for! Very exciting Roxxanne! Love you are doing this blog. Interesting thing happened today. Just returned from Dentist. Dental hygienist tells me she went to Lebanon 2 weeks for vacation. Her husband’s family is from there. (Her previous dentist used to take entire office to CASCADES for parties/special occasions. She saw the dinner show several times.) I told her about you, showed her your photo and the Arabesque B&W troupe photo. Told her you had left for Lebanon due to your film, The Fez Documentary, being in the film festival in Lebanon. Her husband is realated to the Aoun’s in Lebanon. They are a prominent family in Lebanon. What a small world. Amazing! Really a small world! You wrote eloquently about your trip so far…made it come to vivid life….what I read, about your airport experiences and the discussion with the woman who sat next to you….this could very well be a chapter of a book. This makes me so happy and brings many emotions. I can’t wait to read more as your journey continues.